When a CBS correspondent reported last month that Barack Obama’s campaign had a malodorous airplane and a dismissive attitude toward the media, Robert Gibbs, the candidate’s top spokesman, was not pleased. Gibbs, who transition officials say is in line to become White House press secretary, can be funny, gossipy and an invaluable source of information about his boss, journalists say. He also monitors coverage intensively, pushing back against the smallest blog post he considers inaccurate. Now the sparring will take place in the glare of televised briefings. After a career spent working for Democratic candidates and lawmakers, the 37-year-old Alabama native is about to become the public face of the Obama administration. While he can be combative in private, Gibbs is affable and smooth-talking on camera, often deflecting uncomfortable questions with a quip. Colleagues say Gibbs channels the president-elect in a way that goes beyond their shared passion for college football. Obama had an initial tendency to overanswer questions, but Gibbs has taught him how to pivot back to his scripted point. College students on the NAACP’s ‘Vote Hard’ bus tour encourage people to vote in the George Washington Carver Homes housing project in Selma, Ala.
We really feel that this election is going to come down to our ground organization and what happens in the final days of the campaign,” said Jen O’Malley, the Obama campaign’s battleground-states director. McCain has gotten himself caught in his own net ~ through his deregulation tinkering ~ in an area he doesn’t understand – the economy ~ he has left his Wall Street buddies who would have helped him out hard up for cash ~ in addition he has pissed half of them off with his angry rant at the start of the financial crisis. So that many would not support him on princple. On Russia ~ between himself and Palin – have gone out of their way to demonize that country ~ so much so that when a Russian diplomat receives a confidential letter – signed by John McCain requesting funds for his haranguing campaign – it’s not in Russia’s interest to keep the matter confidential. So much for Georgia !! Question is how many other foreign diplomats and embassies has the McCain camp solicited funds from? And what is more ~ is although Russia is developing a market economy – it is still very much a Socialist run state. Although McCain says ‘I’m a Fighter’ no one history has made a comeback – from being 10 points down in the polls 3 weeks before the election – to win. Everyone is wondering – what’s McCain’s message – and maybe he should make that clearer – but I think what has happened is that people have heard his message and haven’t bought it. Tax cut proposals for multi-millionaires and billionaires – while the average person is losing their jobs or seen money tighten through higher prices. And because of the US administration of which John McCain belonged – not only the US economy, but economies around the world have been rocked by decisions John McCain and his trusted economic adviser made – the economic adviser one who was saying America has become a nation of whiners – and the recession was in people minds. God’s on our side says Lieberman ~ not on theirs! If he wants a Jihad ~ struggle — bring it on! You can take so many things away from a person – but I’m not sure God (the Great All) is one. Via CNN streaming video, I watched Sarah Palin’s event in Clearwater, Florida, this morning. She was heartily introduced there by John McCain’s pal Joe Lieberman. The former Democrat is a very strange figure these days, far from his moorings in the Democratic Party. But you can see how his personal friendship with McCain, and his genuine support for the Iraq war, might cause him to help out his buddy on the stump. It was jarring, however, to hear Lieberman’s full-throated endorsement of Sarah Palin, a woman with whom he has no prior relationship, and whose policy credentials you have to think the wonky 20-year Senator would find suspect in any other context. “She’s so strong, she’s so capable, she’s so competent,” Lieberman told the cheering crowd. Emphasizing her “faith,” he added that she is someone who “with your help–and God’s help–will be the next vice president of the United States.” More big cheers. And then it was on with the attacks on Obama: “There are some candidates who use change to promote their careers. And then there are some candidates, like John McCain, who use their careers to promote change,” Palin said. She went on to reiterate charges that Obama is friendly with terrorists (Bill Ayers), wants America to lose in Iraq, and smears US troops in Afghanistan. More: For this heavily churchgoing GOP crowd, Palin is showing a side we haven’t seen in her TV interviews and at the debate. Mentioning the potential for wind and solar power in Florida she exclaims: “God has so richly blessed you here!” Between her and Lieberman, that makes four references to faith and God in about five minutes. I’m of two minds about how to deal with the McCain campaign’s further descent into ugliness. Their strategy is simple: you throw crap against a wall and then giggle as the media try to analyze the putresence in a way that conveys a sense of balance: “Well, it is bull-pucky, but the splatter pattern is interesting…” which, of course, only serves to get your perverse message out. I really don’t want to be a part of that. But…every so often, we journalists have a duty to remind readers just how dingy the McCain campaign, and its right-wing acolytes in the media (I’m looking at you, Sean Hannity) have become–especially in their efforts to divert public attention from the economic crisis we’re facing. And so inept at it: other campaigns have decided that their only shot is going negative, but usually they don’t announce it, as several McCain aides have in recent days–there’s no way we can win on the economy, so we’re going to go sludge-diving. But since we are dealing with manure here, I’ll put the rest of this post below the fold. It is appropriate that the prime vessel for this assault is Sarah Palin, whose very presence on a national ticket is an insult to your intelligence. She now has “credibility,” we are told, because she managed to read talking points off notecards in the debate last week with unwitting enthusiasm. So then, I’d guess, it would be appropriate to bring up some of the nuttiness that passes for godliness in Palin’s religious life. Leave aside the fact that The Embarracuda allowed herself to participate in a cermony that protected her from witchcraft, how about her presence–she didn’t “get up and leave”– at a sermon by the founder of Jews for Jesus, who argued that the Palestinian terrorist acts against Israel were God’s “judgment” on the Jews because they hadn’t accepted Jesus. Calling all Podhoretzs! Where’s the outrage? I mean, don’t the hateful doings at Palin’s church and Hannity’s perfidy deserve a lengthy exegesis from Pete Wehner or Jennifer Rubin or one of the other empretzled ideologues over at Commentary? As I said, I’m of two minds about this. I don’t want to give currency to this sewage, so it will remain below the fold. And I’ll try to devote the lion’s share of my time to the issues–the war, the economic crisis, the fraying health insurance system, the environment–that should define this campaign. But what a desperate empty embarrassment the McCain campaign has become. The half decent and (relatively) factual part of Rove’s speech/article was left out – that’s the way they always start – the following is where he thinks the McCain campaign should go – and how they should get there. So much riding on Palin….I just had my own Rovian thought !! Achilles was only as strong as his heel !! McCain-Palin must deepen those doubts by pounding away on questions about Obama’s character, judgment and values. Drawing on Obama’s own record and statements, they need to paint him as a big spender, class warrior and cultural elitist; they need to say he’s never worked across party lines or gotten his hands dirty solving big issues. But the duo must also give voters reasons to support them. They must crystallize a positive, forward-looking vision so people who see Obama as unqualified have something to hang on to. It can’t be a laundry list of positions. McCain-Palin must offer a narrative about what they will do to help America see better days, especially on kitchen-table concerns. McCain must launch these themes in the two remaining debates. Knockouts are welcome but unlikely and unnecessary. Introducing a theme and sticking to it day after day worked this past July, when McCain successfully depicted Obama as a celebrity taken with his own press notices. The GOP nominee did it right in the first debate when his assaults were formal and indirect (“Senator Obama has the most liberal voting record …”) while Obama was personal and direct (“John, 10 days ago you said …”). McCain and Palin should also respond to key misstatements by Obama-Biden, but only to flip the discussion back to Obama’s own deficits. They should not chase rabbits: that would only occupy time better devoted to who can fix the big stuff broken in Washington and reach across the aisle to work for the American people by putting country first. The election still favors Obama. But Sarah Palin’s debate performance, and the passage of the economic-rescue plan, may bookend a bad couple of weeks for McCain. He has a month to turn things around. It’s doable; but it won’t be easy. Did the cat get John McCain’s tongue on economic issues? This Washington Post headline is not real…. 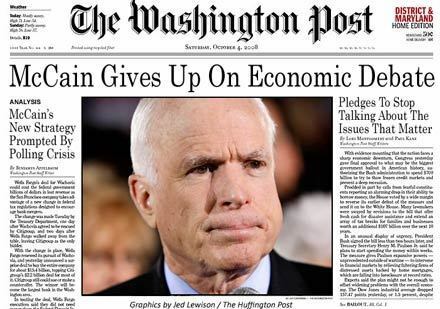 But what is interesting is the fact that John McCain hasn’t been talking about the economy. 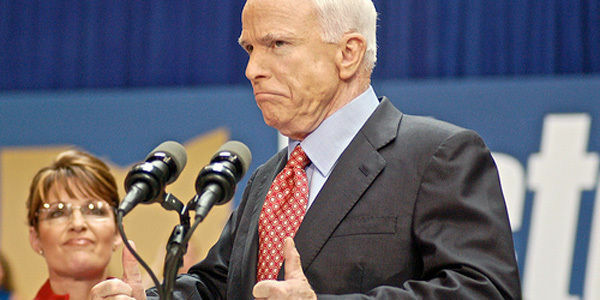 McCain plans to go after Obama hard in the coming weeks – but what can he say that he has not already said. McCain’s best chance is to make this election about personalities – like – Palin looks great – vote for me !! But with the financial crisis – piled on top of 1 million home foreclosures – and almost 800,000 jobs lost this year alone – McCain is going to have a difficult time stirring this election back round to a personality contest! Anyway McCain says he plans to let it all out – to remove the gloves – NEXT TUESDAY !! Set your clocks folks for the Straight Talk Showdown! Sen. John McCain and his Republican allies are readying a newly aggressive assault on Sen. Barack Obama’s character, believing that to win in November they must shift the conversation back to questions about the Democrat’s judgment, honesty and personal associations, several top Republicans said. With just a month to go until Election Day, McCain’s team has decided that its emphasis on the senator’s biography as a war hero, experienced lawmaker and straight-talking maverick is insufficient to close a growing gap with Obama. The Arizonan’s campaign is also eager to move the conversation away from the economy, an issue that strongly favors Obama and has helped him to a lead in many recent polls. “We’re going to get a little tougher,” a senior Republican operative said, indicating that a fresh batch of television ads is coming. “We’ve got to question this guy’s associations. Very soon. There’s no question that we have to change the subject here,” said the operative, who was not authorized to discuss strategy and spoke on the condition of anonymity. Being so aggressive has risks for McCain if it angers swing voters, who often say they are looking for candidates who offer a positive message about what they will do. That could be especially true this year, when frustration with Washington politics is acute and a desire for specifics on how to fix the economy and fight the wars in Iraq and Afghanistan is strong. Robert Gibbs, a top Obama adviser, dismissed the new McCain strategy. “This isn’t 1988,” he said. “I don’t think the country is going to be distracted by the trivial.” He added that Obama will continue to focus on the economy, saying that Americans will remain concerned about the country’s economic troubles even as the Wall Street crisis eases somewhat. Moments after the House of Representatives approved a bailout package for Wall Street on Friday afternoon, the McCain campaign released a television ad that challenges Obama’s honesty and asks, “Who is Barack Obama?” The ad alleges that “Senator Obama voted 94 times for higher taxes. Ninety-four times. He’s not truthful on taxes.” The charge that Obama voted 94 times for higher taxes has been called misleading by independent fact-checkers, who have noted that the majority of those votes were on nonbinding budget resolutions. McCain’s only positive commercial, called “Original Mavericks,” has largely been taken off the air, according to Evan Tracey of the Campaign Media Analysis Group, which tracks political ads. Yesterday in Pueblo, Colo., McCain made clear that he intends to press Obama on a variety of familiar GOP themes during the debate, as he accused the Democrat once again of getting ready to raise taxes and increase government spending. “I guarantee you, you’re going to learn a lot about who’s the liberal and who’s the conservative and who wants to raise your taxes and who wants to lower them,” McCain said. A senior aide said the campaign will wait until after Tuesday’s debate to decide how and when to release new commercials, adding that McCain and his surrogates will continue to cast Obama as a big spender, a high taxer and someone who talks about working across the aisle but doesn’t deliver. Two other top Republicans said the new ads are likely to hammer the senator from Illinois on his connections to convicted Chicago developer Antoin “Tony” Rezko and former radical William Ayres, whom the McCain campaign regularly calls a domestic terrorist because of his acts of violence against the U.S. government in the 1960s. McCain advisers said the new approach is in part a reaction to Obama, whose rhetoric on the stump and in commercials has also become far harsher and more aggressive. They noted that Obama has run television commercials for months linking McCain to lobbyists and hinting at a lack of personal ethics — an allegation that particularly rankles McCain, aides said. Campaigning in Abington, Pa., yesterday, Obama continued to focus on the economy, even as he lashed out at McCain. Obama highlighted a new report showing a reduction of more than 159,000 jobs last month, and he linked the bad economic news to McCain and Palin. Before the bailout crisis, aides said, McCain was succeeding in focusing attention on Obama’s record and character. Now, they say, he must return to those subjects. Oops that was 133 – the new figure for the lobbyist in and around the McCain camp – is now 134! It can be argued that lobbyist are people ~ too – So McCain could still be Working For You! Here’s John McCain is full fixing mode – off to fix the financial crisis – in the meeting with the President Obama and others John McCain’s voice was barely audible! Obama did attend on the request of the President – who has been making such a big deal about suspending his campaign – in order to deal with the problem – had almost nothing to add – given the perfect opportunity. Let’s see how long this charade can continue – will he or won’t he show up for the debate tonight? That he also wants to postpone the VP debate is telling – a Biden vs. Palin debate – everyone can’t wait to see that – could McCain think she needs more time to prepare? We would love to hear more about the Russian Alaska connection.